Fresh from seeing Jason Molina's Magnolia Electric Company in Austin at SXSW, I wanted to do something strong that captured the mythic and dark feel of the band. 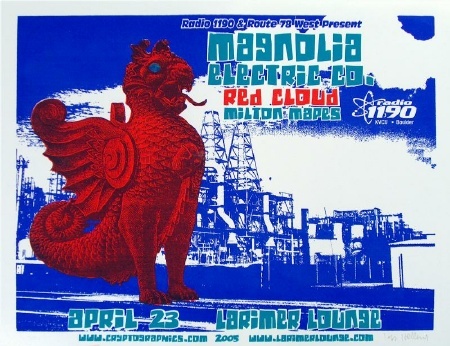 The background photo of the poster was shot at night at an oil refinery near Galveston. I got woke up by a cop at 4am there, sleeping in a car on the beach. The gryphon in the foreground is a Babylonian golden idol, and there's some connection to our worship of the 'black gold' I was trying to illustrate. There's an element of classic Band and Southern Rock in the song structure and instrumentation of Magnoila Electric Company that really translates on stage. These guys tour all year, and it was a tight set at the Larimer Lounge. What a great night.